“Sweets” for the Sweet – Nigorimasen! Ever tried a new type of candy? The wrapper makes it sound interesting, so you get it, and, upon gulping it down, were disappointed in that it wasn’t what it seemed? I mean, it’s an OK candy, but you were expecting more or something else. 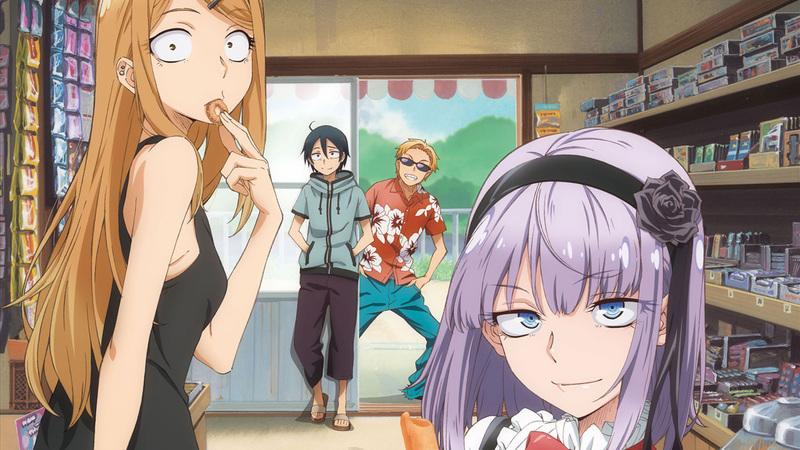 My sad little tale explains everything right and wrong with “Dagashi Kashi”. Now, to make things even more convoluted, this is one of those Japanese language puns. If you pronounce it as ’Dagashi Kashi’ it means ‘cheap sweets candy’, but if read or said as ‘Daga Shikashi’, it can also mean ‘however’. The show is like that. If Hotaru can convince Coconuts (that’s Koko’s nickname) to take over the shop, Yo will go to Tokyo. Aiding in all of this are Coconuts’ two best friends, the brother and sister combination of Saya (her, left) and To (him, shades) who run the local café. This is where the tale goes astray. It ends up being an….E/I show! No, don’t run screaming into the sunset! Stay with me for a bit! E/I is a designation for shows that are Educational and/or Informational. In a broad sense of the term, the series “Spice & Wolf” was an E/I, a caliber of capitalism primer and how to make it as a businessman. For this show, it began with Hotaru quizzing him about the multiplicity of candies and treats out there in the world. That makes sense: how can you sell that which you don’t understand? Do you understand that which you sell? But it ended up being a history lesson on what those Japanese will eat. Seriously, you would eat pickled radishes? Right next to the Fortune Chocolate? So, it got bogged down with all that minutiae about fugashi and binramune and Super Scary Story Gum. The original idea is still there, but it evolved into a caliber of love-ish story and it appeared that Hotaru lost her way or her zeal or her drive. I was also amazed that she gobbled down all those sweets and never gained an ounce (and she has a stunning figure). Also, Coconuts’ drive to be a manga artist was relegated to more of comic relief (Hyuk! Hyuk!) and not more of a bone of contention or a deal breaker towards The Bet. The artwork is a bit odd, in that the eyes have rings (you can see it in Hotaru’s eyes) and since there are a lot of close-ups, it starts to grate on one. In fact, the eyes are really weird for this show and anime eyes are usually odd to begin with. I wished that the story had stayed more on target, with everyone pushing on Coconuts to take over the candy store, BUT allow him to also pursue his dream to be a manga artist. I also had a deeper question: does this shop do so well because it is the only place like it for miles around? Then you have a captive audience and sales will be brisk, even if what you have isn’t that good. All in all, it is a cute series, but much like devouring a box of Screaming Yellow Zonkers, you feel a bit empty at the end. You started out with Dagashi Kashi, but ended up with Daga Shikashi. Oh, just for your reference, those boxes on the highest shelf on the right? Those are plastic models of cars and ships and Gundams. It is a bit of a nostalgic trip. It took me about 40 years and seven valiant attempts to finally enjoy anime. Whether I grew into it or the stories got better, things have been percolating along since 2004. Tagged comedy, Dagashi Kashi, love story, Slice of Life.